Michael James "Jock" Bowie Hobbs was a New Zealand rugby union player who was an All Blacks flanker who played in 21 tests between 1983 and 1986, with four tests as captain. In recent years he was prominent in rugby administration. 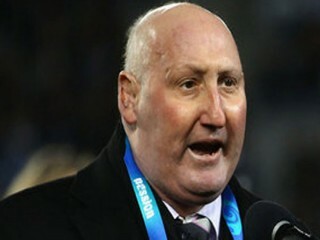 Between 2002 and 2010 he was also chairman of the New Zealand Rugby Union before standing down due to illness. Hobbs was influential in bringing the 2011 Rugby World Cup to New Zealand in his role as NZRU chairman and was chairman of the organising committee for the tournament. In 2010 he resigned from the NZRU to focus on his health, but was involved with the tournament, presenting All Blacks Richie McCaw and Mils Muliaina with their caps after playing their 100th Test matches. Hobbs played 21 Tests for the All Blacks at flanker between 1983 and 1986 but retired at 26 after suffering a series of head concussions. Hobbs died on 13 March 2012 at Wellington Hospital. Hobbs is survived by his wife Nicky, a sister of former All Blacks fullback and Wallabies coach Robbie Deans, and four children. View the full website biography of Jock Hobbs.